As leader of the Islamic Movement in Nigeria, Sheikh Ibraheem Zakzaky, his wife Malama Zeenah spent over 3 years in illegal detention despite the regularly series of calls by millions of followers, counsels, human right groups and international communities, Sisters Forum of the Movement have organized a press conference lending their voice to the world in need of liberation of their leader. The conference which took place at Magadishu Multipurpose hall, located at Ahmadu Bello Way, Kaduna, at the early hours of today Monday 14/01/2018, was well attended by sisters of the Movement and was chaired by Malama Jummai Karofi. Addressing a session of journalists at the conference, Malama Jummai expounded the untold atrocities and injustice mated to Sheikh Zakzaky and his followers. She traced the genesis of the unprecedented deadly attack by Nigerian Army on 12 to 14th of December 2015, on defenceless and law abiding citizens, which she said is well preplanned. Malam Jummai explained how a Division of the Federal High Court in Abuja delivered a final judgement on a case filed by Sheikh Zakzaky before the court, where it finally ruled that Sheikh Zakzaky should be released within 45 days with a sum of N50 millions as a compensation for the damages inflicted on him and his property. In addition to that, the court had also directed the Federal Government to provide a temporary accommodation for the couple since it was justified that, the Nigerian Army and the Kaduna state government had burnt and demolished their private residence located at Zaria. But the government under President Buhari has however refused to comply with the order, in spite of that, claiming that they were put under protective custody. Mal. Jummai exemplified how various human rights groups both national and international, put forth series of treatises regarding this inexplicable injustice on Sheikh Zakzaky and his wife particularly the senior counsel to the couple, Mr. Femi Falana (SAN). There was even a one time hand written later sent by the counsel to Mr. President dated November 7th 2017, in a fresh request demanding for their release. 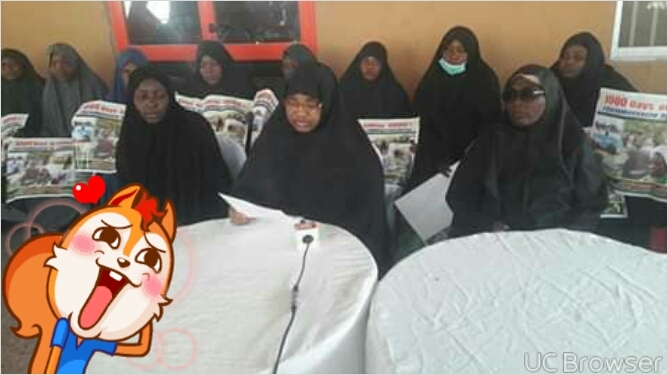 As stated by the speaker, to the journalists "It may interest you to know that the medical condition of Mrs. Zeenat El-Zakzaky is by far worse than that of her husband. For reasons best known to the State Security Service personnel where the couple are now being held in one of their detention facilities in Kaduna, up till now as we are carrying out this Press Conference, some of the bullets lodged in her body during the brutal attack of December 14, 2015 have not been extracted. She has been subjected to excruciating pain and agony, on a daily basis. Her life which is currently in danger may be saved and prolonged if she is allowed to receive adequate medical attention without any further delay”. Malama Jummai Karofi further said that, the Judicial Commission of Enquiry which was set up by the Kaduna State government to investigate the remote and immediate causes of the violent attack unleashed on Sheikh Zakzaky and his faithful followers in December 2015 did not recommend the indefinite incarceration or prosecution of Sheikh Zakzaky and his wife for any criminal offence whatsoever. Lambasting the Buhari regime for its flagrant disregard of rule of Law, Mal. Jummai said “The Buhari regime is deaf and dump claiming that it operates under the rule of law. Hence, court orders and fundamental human rights of its citizens are treated with disdain". The conference was also attended by national and international media houses.